Movable Type provides administrators with the means of quickly and easily installing a set of templates that together work to create entire web sites and applications, such as blogs and forums. When you create a “blog” within Movable Type, the application will prompt you to select the “Template Set” you want to use when creating the blog. 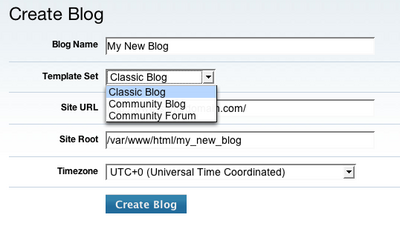 You can also apply a template set to an existing blog by navigating to “Templates” found under the Design menu. From there, click the “Refresh Templates” link under Actions. 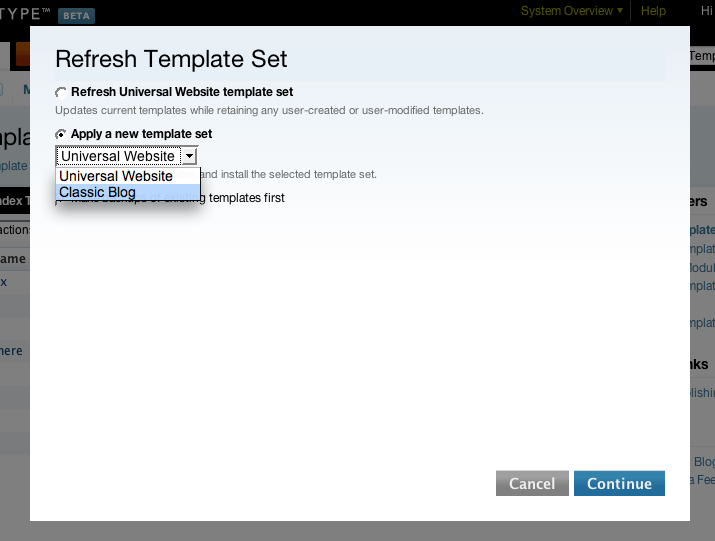 A dialog will pop up and allow you to refresh your current template set, or apply a new template set to a blog. An option is also presented to create backups of your existing templates if you wish. If that box is checked, Movable Type will create a copy of each of your templates and time stamp them so that you can always revert changes to individual templates if you wish. Your backed up templates can be found by clicking the “Backup Templates” filter found under Quick Links on the main template listing screen. 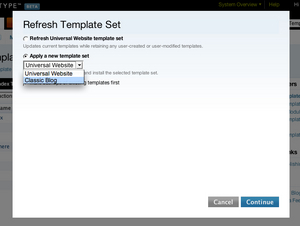 Note: When only one template set is available within the system, the pull down menu is suppressed. By default the free versions of Movable Type only come with a single template set called the “Classic Blog” template set - which is the official default templates for Movable Type. Registering Template Sets - learn how to package up a template set as a plugin to easily distribute it to customers. Template Exporter Plugin - Mark Carey produced a great plugin that automates the process of creating a template set from an existing blog. Perfect for beginners and non-technical folks. The imported stylesheet for the template I like is “/mt/mt-static/support/themes/unity-green/unity-green.css” but I cannot figure out how to access it to tweak the green and the gray so that they match the colors I use elswhere in my site. Can you help? There is no standard way to install a template set from one that you’ve downloaded. That process depends greatly upon how the person who wrote the template set has packaged it. Generally speaking though, people are always encourage to package plugins such that one just needs to unpack the plugin archive and then to copy the archives contents into the same directory as mt.cgi - making sure to preserve the directory and file structure during the copy. Out of curiosity, what template set have you downloaded? There are several template sets which are available for use but I can’t find a description of how they are different. The titles tell me something, but it would help to have a list that spells out the advantages of each. 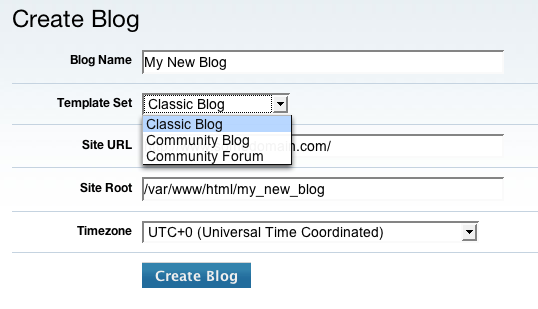 I installed the Community Blog. Everything works as advertised. My problem is that I want to customize the HTML content of the Beta and Gamma columns. But, in the templates they don’t appear anywhere that I can see. Very weird that the Header contains the initial Alpha tags for the first column, but, no subsequent templates contain any reference to Alpha’s closing tags or the Beta and Gamma HTML. Would appreciate a pointer as to how to access the content of these columns. @DavidRemer You should look in the global templates and widgets. System Overview, then templates. You’ll find those pesky missing template there. Hello, I do not have any Universal Template or the Professional template. Did I do something wrong during the install? I am on MovableType 5. Thank you. @annadavid: I would try to reinstall MT to see if that works. I actually had the same problem once. A reinsallation, while not ideal, did definatly help.